Looking for a sudoku challenge? 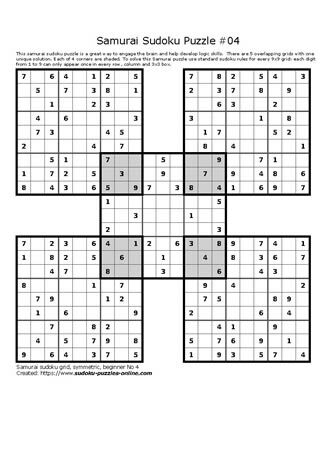 This interlaced 5-grid samurai sudoku puzzle is sure to keep the brains engaged, while using logic to find the one unique solution that solves it all! This puzzle is categorized as beginner, or easy, but given that there are 5 connected grids, easy is relative. To solve the puzzle make sure that the digits from 1-9 only appear once in each of the rows, columns and 3x3 boxes. The intersecting 4 corners have been shaded to help with solving those areas of the puzzle.